Redding Road resident Melanie Marks is searching for the owner an Ammi Phillips portrait, sold at auction in Massachusetts in 2001. FAIRFIELD — Marriage. Divorce. An out-of-wedlock baby. A disgraced stockbroker. Suicide. A famous artist. For a writer on a soap opera, all elements of a daily script. 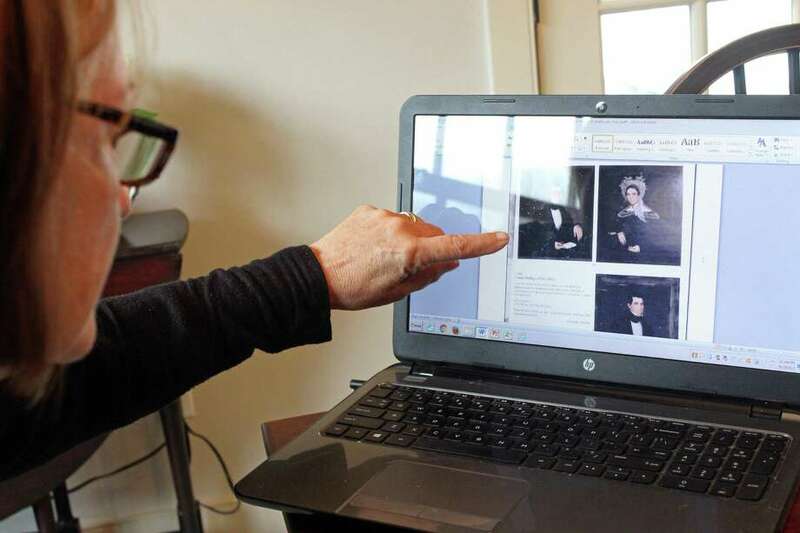 But for Redding Road resident Melanie Marks, they are pieces of a puzzle she’s spent several years unraveling in a quest to identify the subjects of some Ammi Phillips portraits. Phillips, who was born in Colebrook in 1788, traveled through, and lived in, western Connecticut, Massachusetts, and New York State. The three portraits that have Marks’ attention are from the time when Phillips lived in Kent. Marks, who owns Connecticut House Histories, was given the task about two years ago by a high-profile client, who purchased two of three Phillips portraits that were sold at by Skinner Auctioneers in Massachusetts. The portraits were purchased for a historic home in Kent her client was restoring. The two portraits, of a man and a woman, were sold as one lot by Skinner and identified as a husband and wife. But her research has led Marks — assisted in her detective work by her sister in Ohio — to believe that the “real husband” was actually the portrait of the second man, that was put up for auction separately. If she can find that third portrait, Marks said, she might be able to put names to the portraits. What she needs to see, she said, is the letter the man in that third portrait is holding in his hand. It was Phillips’ M.O., Marks said, to paint men holding a newspaper or letter. The newspaper would include the paper’s masthead and date, the letter a name. Maie was left an orphan after her father died in 1895 and her mother in 1898. An aunt, Flora Straight, was appointed Maie’s guardian, and Maie went to live with her aunt, uncle, and grandmother, Rachel Ann Peet Straight, at her grandparent’s home in South Kent. In 1902, Maie attended the Lasell Female Seminary in Massachusetts, graduating in 1906. Marks thinks Maie’s aunt gave her the portraits in 1911, when Maie married George Grebenstein, which has Marks believing the “real husband” and wife portraits are Maie’s grandparents. Adams, however, was indicted for keeping a “bucket shop” — playing the stock market using the funds of unwitting investors — and stealing $10,000 from a client. He was sentenced to three years in The Tombs, a municipal jail in Lower Manhattan, but not before both Maie and his wife left him. After he was released from prison, Adams returned to his wife. In 1931, he committed suicide behind the John Hancock building in Boston. After marrying Grebenstein, Maie had her daughter Helen’s last name legally changed to Grebenstein in 1912. Maie’s marriage to Grebenstein, however, didn’t last and they divorced around 1921. It was Grebenstein who filed for the divorce, citing his faithfulness, but Maie’s “cruel and abusive treatment” starting in November 1920. In 1924 Maie married LeRoy Colburn in Providence, R.I., and it appears they may have separated but never actually divorced. In fact, Maie’s death certificate lists Colburn as her husband. The 1940 federal census found Maie living as a boarder in a boarding house in Boston, managing the Fenway Club. She gave “widow” as the answer to the census question regarding her marital status, even though Colburn was still alive and well and living in Hyannis, Mass. Her daughter, Helen, married Benjamin Snow in the early 1940s, and they bought a house in Wellesley Hills, Mass. Marks thinks the trio of portraits were given to Helen as a wedding gift from Maie. Helen and Snow divorced in October of 1973, and four days later, Helen married Donald J. Marquis. Snow moved to Saint Croix in the U.S. Virgin Islands and remarried, but later ended up living with Helen and her second husband, acting, according to Marks’ research, as a type of butler and chauffeur for the couple in Marquis’ Rolls Royce. Marquis died in 1982, leaving a $1.3 million estate to Helen, and Snow convinced her to create a will. She set up the Helen E. Marquis Trust, with herself and Snow as trustees. Snow died before Helen did, but not before transferring $450,000 of the trust’s money into his own bank account, which until then only held $354. Helen herself died in 1992, with no direct blood heirs. The portraits then ended up with Douglas Snow Burns, a nephew to Benjamin Snow. It was Burns’ son, Donald Burns, who brought the portraits to Lapham & Dibble Galleries in Stowe, Vt. for an appraisal. Through the appraiser’s affiliation with Sotheby’s, the three portraits were put up for auction — with the “real husband” and wife correctly listed together. The minimum price wasn’t met, and the portraits were kept at gallery owned by Burns’ relative until 2001, when they were once again put up for auction, this time with Skinner. That time, however, Marks said, the portraits were not properly paired, leaving her client with the portrait of the woman she thinks was Maie’s grandmother and a man who was not Maie’s grandfather. Tracing the provenance of the portraits, Marks said, was a daunting task, compounded by the improper pairing and an incorrect spelling. The Skinner Auction provenance showed the ownership of the portraits passing from the Adams family, to Helen Snow, and then to Helen Markey. The spelling of Helen’s last name as “Markey” led to several dead ends, Marks said, until Marks’ sister, Melissa Beyerlein, came across the correct spelling: “Marquis.” It was that discovery, Marks said, that broke the dam open and began tying all the research together. “This was a huge challenge, to crack the provenance,” Marks said, but added, “We’ve had so much fun doing this.” And, she said, they believe they have also been able to put a name to another Phillips portrait, though not one owned by her client. There are hundreds of Phillips portraits, Marks said, that are unidentified with the subject’s proper name. But the excitement of determining the lineage of the portraits has been tempered a bit. Marks made a request to Skinner — could they pass her contact information along to the person who purchased the third portrait? Skinner, she said, told them they only keep records for seven years and no longer have that information. Now, she’s hoping to spread the word of her search, in the hopes that the owner of that third portrait will hear about it and get in contact.